St. Patrick’s Day is tomorrow, and while most of us won’t celebrate by going to the “pub”, there are still several ways to enjoy this colorful, festive day! Whether you’re getting together with friends or hanging out with your family, why not take this opportunity to talk about the things that make you consider yourself lucky? Can’t think of much? How about the friends or family you have? Or the way God loves you? Chances are, if you take a minute to think about it, your list-o-luck is quite lengthy! From the Long Hollow Women’s Ministry to you, Happy early St. Patrick’s Day! St. Patrick’s Day is the most widely celebrated saint’s day in the world (which would include St. Valentine’s Day)! It is observed by the Catholic Church, the Anglican Communion (especially the Church of Ireland), the Eastern Orthodox Church and Lutheran Church. It commemorates Saint Patrick (c. AD 387–461), the most commonly recognized of the patron saints of Ireland, and the arrival of Christianity in Ireland. 2. Click here for St. Patty’s Day crafts and decorations, including straw toppers, table arrangements, and even clover hair-pins! 3. 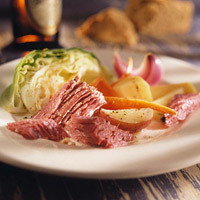 Anyone up for the traditional Irish feast of corned beef and cabbage? Prep time is only 10 minutes…might be worth a shot! Click here if you’re interested in the recipe! 4. While you’re crafting and/or cooking, crank up the Irish jams! This Pandora Radio station might be fun to listen to while you’re doin’ your thing! If you don’t regularly use Pandora Radio, you should try it out! You can sign up for a free account in under two minutes and listen to music of all kinds according to the styles that you like and choose for yourself…for free! 5. And for dessert, of course…Lucky Charm cupcakes! Click here to find the recipe! Looking for a more natural/healthy alternative for dessert? Try some Rainbow Fruit Skewers! Do you have any other suggestions for celebrating St. Patrick’s Day? Will you try any of these that we’ve listed? Love those cupcakes! I’m definitely going to have to try them!